This client wanted to pursue a guest post strategy in which we would find good quality websites in relevant niches (renewable energy, energy policy, clean tech, green home, etc. ), and write guest posts that contained natural, contextual backlinks to other pieces of content that lived on the client's blog. The first thing we did was to analyze existing content on the client's site to see what was "link worthy." Fortunately, this company already had a wealth of articles on their blog that were well written and informative! We decided on a few different pieces of content that we thought would work great for link building. The next step was to make a list of hundreds of blogs and websites that we deemed a worthy fit for our client's content. 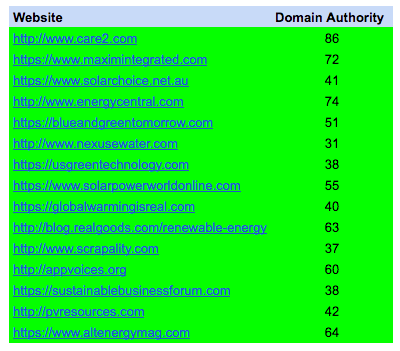 These ranged from renewable energy blogs, to green home blogs, to online science magazines, to income saving blogs (after all, going solar helps people save on their energy costs!) We created a database and pulled all relevant information including MOZ Domain Authority, the types of content they like to write about, existing blog posts we could reference, and the contact information of the blog's editor. We then sent a personalized, automated message to each of those potential linkers we identified in the previous step. We have a proven messaging sequence we use for this that works extremely well! Our response rate is typically in the 45-55% range.